2 July 2015, at 12:00a.m. There has been a resurgence of interest in thermal fogging disinfection methods in the poultry industry recently, to get a good distribution of the active substance and improve biosecurity. There has also been more experimentation with different active products as the use of traditional chemicals such as formaldehyde has been called into question on grounds of hazard and toxicity. ThePoultrySite spoke to Toby Heppenstall (TH) – General Manager, and Arno Schut (AS) - Technical Manager of the well-known universal disinfectant brand Halamid®, to get an idea of the exciting progress that has been made in this area. Q: What is Thermal fogging? TH: Thermal fogging is the generation of ultra-fine droplets in a range of 1-50 μm using thermopneumatic energy. Liquid substances are vaporised at the end of fogging barrel and form ultra-fine aerosols by condensing on contact with cool ambient air, on being ejected, to create dense visible fog-clouds. Q: What are the benefits of thermal fogging in the poultry industry? TH: In biosecurity in general, active substances should be uniformly distributed, even in inaccessible places, without leaving undesirable residues: Thermal fogging is ideal for this. In addition, fogging can be an economical solution for treating large spaces like poultry barns with a minimum quantity of active substance, meaning less operational work, quicker completion, and lower environmental residues. AS: On top of that we know that Halamid® has a mild toxicity and is environmentally sound, so the efficient fogging method definitely complements our product in this respect. We also find that poultry customers like to perform a thermal fog as the final step of a biosecurity protocol, once the equipment and floor insulation (straw or wood shavings) are all back in the barn. The dryness of the fogging method makes this possible and gives extra confidence in controlling any pathogens reintroduced after equipment and dry organic matter is put back. Q: Can fogging replace wet disinfection? AS: We don’t recommend this for a poultry barn. A high pressure spray of disinfectant is a very thorough method of controlling pathogens on all hard surfaces which is where the pathogens mainly reside and multiply. Having said this, we have some customers who successfully combine the benefits of a wet spray and a dry fog by producing an aerial mist of very fine water droplets. To be successful however this requires fairly high investment in suspended system of hydrofans with nozzles, integrated with pump and solution intake. More usual is a wet spray followed by a dry fog. Q: Can any disinfectant be fogged? TH: A number of types and brands of disinfectants can be fogged, but it is important to get the right dosage and solution, perhaps including a fog-enhancer. Leading disinfectant brands publish guidelines about fogging usage in their literature. We have carried out trials with Halamid®, so we can vouch that it works well according to the guidelines. Modern formulated disinfectants with good hazard and toxicology profiles certainly offer advantages compared to traditional products like formalin in that less dangerous fumes dissipate more quickly to safe levels and the barn is re-usable within hours instead of days. Faster turnaround between cycles is naturally attractive for poultry producers. Q: How do you know that fogging Halamid® is effective? AS: We have done comparative studies and found Halamid® to be particularly efficient and fast acting. The test protocol used infected dipslides suspended in the air inside the barn. The results demonstrate that modern branded disinfectant formulations can be used with confidence to replace carcinogenic and toxic formaldehyde fumigation at about one fifth of the formalin dosage. Halamid® achieves the same efficacy score as formalin even at this reduced usage rate. Q: Do you need to use a fog promoter / fog enhancer? AS: As Toby said, it depends on the product. 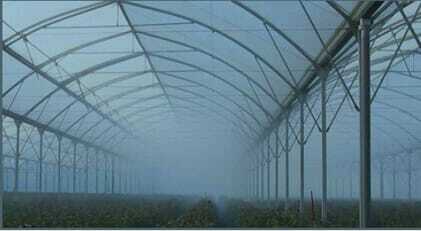 Our experience is that fogging agents give a more persistent, whiter mist that will float in the air longer, however we have not experienced better efficiency as a result. If desired we would recommend using a cost effective agent like monopropyleneglycol (MPG). From a practical point of view we also caution users that the white fog created with the use of fogging agents can look like smoke or fire from a distance, which may provoke reaction from neighbours. Q: Would poultry farmers need to use a contractor or could they fog Halamid® by themselves? AS: Some farmers prefer to use a contractor for the guarantee or because it fits with other services which is understandable. But using a fogging machine is really no more complicated than using a lawn mower. Manufacturers often provide basic training and support, and very quickly any operator can become proficient. Hence mechanically speaking, it is entirely possible for poultry farmers to adopt the technology for use by their own staff. As long as they are OK with the chemicals handling - on which point of course, there is a distinct advantage in fogging Halamid® which is much less dangerous for handling and exposure-risk than formaldehyde. Q: How much disinfectant is needed to fog a typical poultry barn? TH: Different manufacturers recommend different amounts, typically between 0.5 and 2kg of the neat commercial disinfectant product per 1,000m3 internal volume. Dosages should really be recommended per cubic volume rather than per square area, because you’re talking about a method which fills 3D space. In the trials mentioned above, where fogging was performed as the only disinfection step, we obtained great efficacy results using 2kg of product (actually 20L of a 10% solution) per 1000m3. For a terminal fog which follows a first stage wet disinfection step – which we recommend in practise - half that amount should be sufficient, and we intend to prove in future trials that still lower application rates of Halamid® are effective. Q: What is the standard protocol and how long does it take? AS: It’s quite simple to prepare and quick. Mix up to 10% of Halamid® in water. For example 1kg Halamid ® in 10L water in a bucket. Mix the solution for a minute with the mixing unit until all Halamid ® particles are dissolved and a clear solution results. Pour the contents of the bucket into the reservoir of the thermal fogging machine. If a whiter fog is desired up to 20% of the solution can be replaced with MPG, for example 1kg Halamid ® in 8L water and 2L MPG. Although Halamid ® is a very safe chemical, remember to always wear suitable protective equipment (safety goggles, gloves and respirator). For the actual fogging, turn on the fogging machine and operate at a flow rate of 1L/min for at least 30 minutes. Ventilate after the elapsed exposure time for about 30 minutes until all the fog has visually disappeared. Q: Is Halamid® really safer than formaldehyde? AS: Yes. Of course, our guidelines also specify the need for the operator to wear protective equipment including a respirator during operation, but Halamid® is at worst labelled corrosive, whereas formaldehyde is toxic and carcinogenic. Further information on Halamid® can be obtained from www.axcentive.com, by emailing info@axcentive.com or by calling the Axcentive sales office on +33 442 694 090.